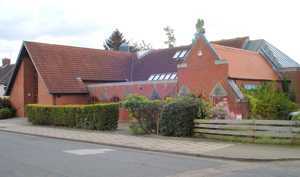 St Luke’s, Gamston and Bridgford, is a suburban parish created in the second half of the 20th Century. It was set up in 1951 as a daughter church of St Giles’, West Bridgford to serve parishioners on the fringe of that parish and to cater for the increased population of the first of the post-war housing developments. From the outset it was seen as a dual-purpose church fulfilling both spiritual and social/community needs. The relationship with St Giles’ continued for nearly forty years - until 1990 when St Luke’s was accorded separate parish status, due largely to the building of over a thousand new houses on the adjacent Gamston Estate. The expansion of the church has been reflected in its buildings. The first church comprised temporary wooden huts which were superseded in 1957 by a more substantial wooden structure. This lasted until 1995 when the first phase of a brick-built church was consecrated. The second phase was completed by the end of 2000 to give the church as it appears today though some re-ordering of the interior was carried out in 2005.